BEST VIEWS OF PRAGUE CASTLE AND VLTAVA RIVER!! Stay in the heart of Prague on Vltava River, walk to Charles bridge, Old Town, or Prague Castle. Near National Theater with many restaurants, bars, cafes, shopping and markets. Luxurious Flat!! full amenities!! Elevator. Adjacent to island with park. 1st Master suite consists of King Bed, Dresser and seating area. Bedroom 3 consist of Double bed and single sofa bed. Bathroom 1 Sink, Shower Tub and Toilet. Bathroom 3 private toilet and sink. Full kitchen with refrigerator, dishwasher, stove, oven all dishes, pots, pans, utensils and also washing machine. There are is several fans and cooling towers but not typical air conditioning as in USA. 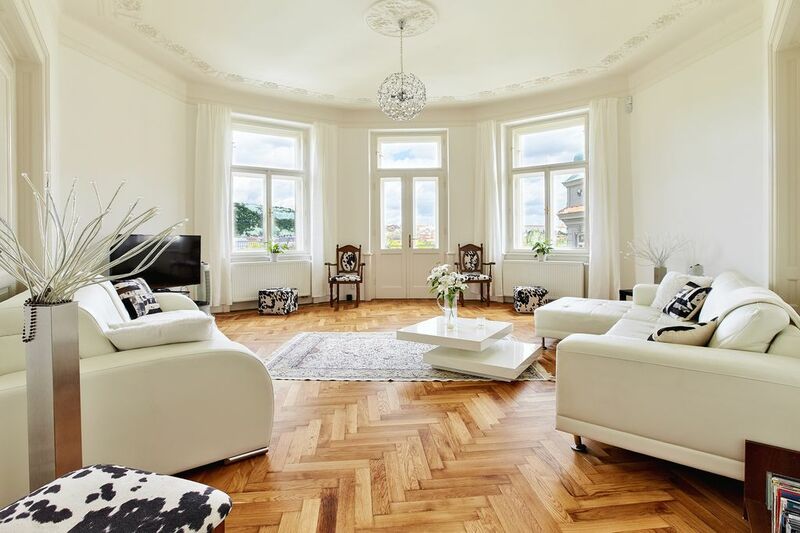 There is nothing like the comfort of home while visiting Prague, from this apartment you can walk to all local sites, theater, many shops, cafes, bars, restaurants. Centrally located walk to old town Charles Bridge ETC. taxi from airport for 4 persons 625 czk for 7 persons 860 czk please send fight number and arrival time, and I can arrange pick up. The house was wonderful, the owner, not so much. We arrived at the rental and were pleasantly surprised at the beautiful layout of the home the aesthetics, the views. We immediately noticed that the house didn’t have linens in the bathrooms and several bedrooms didn’t have enough linens on the beds. I wrote to the owner and was dismissed as she said there were enough bedspreads throughout the home for the amount of people we booked for...... so we shuffled everyone’s linens around to accommodate. No towels in the bathrooms, we found some in the linen closet. Fast forward to the day of check-out: We walked through the home to tidy it up, collected any small garbage, made the beds, etc. The home was tidy when we left as a rental would be. 1 week later we receive a message from the owner that we broke the coffee table, broken trash can and there was “debris” throughout the home. She demanded over $450 from our insurance company to replace these. This is a downright fraudulent claim as when we were at the home a week earlier visiting friends who rented it, we noticed the coffee table was already broken, and messily glued together. The trash can was absolutely not broken when we left. This home is lovely but to leave it in cared-for condition as when we checked in and to have her try to post a claim on our insurance to improve her home is downright wrong. Do not recommend this rental for this reason. I strongly believe you did not even stay in my flat but made reservation for a bunch of your reckless friends..
2 Towels per guests were on beds, and 20 plus extra in linen storage. Table was not broken when your friends arrived!! The claim paid was 220 US dollars.. Does not even cover damage!!! A heavy duty plastic trash can lid was completely destroyed.. how is that even possible to break?? 2 EXTRA LARGE bags of trash were in flat as well as debris through out apartment for a 4 night stay only 5 people?? Reservation was for 5 persons, 5 blankets and 8 pillows were provided,,, your friend wanted EXTRA blankets NOT towels!!! There are many extra throw blankets in apartment. We were so impressed with our entire experience! From our host who was prompt so answering all our questions, the first walk-thru of the apartment, the views from the apartment and the location itself. We walked everywhere whether it was to the Charles Bridge, the Prague castle (that you truly see from the apartment) or the Old Town Square the location was perfect. The size of the apartment was amazing as well. We were seven adults travelling together and so we appreciated how much space we all had. Our time spent in Prague was a wonderful way to end our European vacation. Thank you Renata for sharing your little piece of heaven!! This unit is spotless. It is centrally located and a short walk to everything that needs to be seen. It is also huge. Très bel appartement: spacieux, propre et bien situé! L'appartement est idéalement situé: en proximité du fleuve et pas très loin du centre historique, on profite également d'une très belle vue sur le château et le fleuve! L'appartement est très spacieux, calme, lumineux et est très bien équipé... nous n'avons manqué de rien! Aucun regret d'avoir choisi cet appartement pour notre week-end en groupe pour aller courir le marathon! merci également à notre hôte de nous avoir envoyer un taxi pour venir nous récupérer à l'aéroport!